In the professional writing world, it pays—sometimes literally—to be able to write a lot in a short period of time without completely melting your brain. Every once in awhile, it is important to take breaks and let your mind recoup. 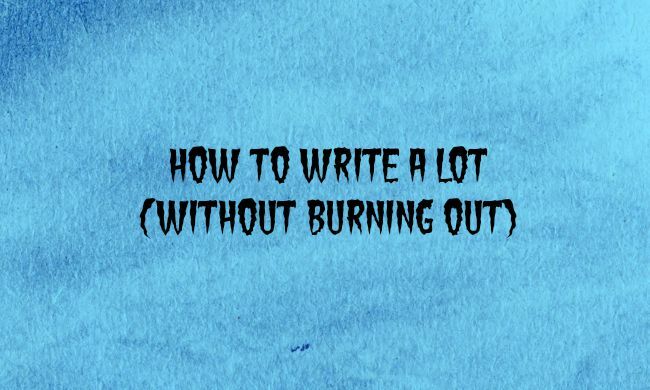 But there are a few ways you can work toward getting better at writing more without feeling brain dead at the end of the day, and we’re here to share some of them with you. We’re going to focus on professional writing in this post—online publishing, articles, blogging—but some of these concepts can also be applied to some areas of creative writing, too. If you’re pursuing a professional writing career, there will be times you’ll have to write about topics you’re not completely familiar with—which yes, means you’ll have to do a lot of research to give your project credibility. But outside of work, you have the freedom to write about what you know best. Always take advantage of the opportunity, even when writing seems to be wearing you down. It’s easy to ramble on and on and on about your so-called field of expertise, and sometimes that can be a good thing. When we write more, we train ourselves to lay out our points and arguments in an organized manner before trimming them down to a much more appealing 500 words or less. There’s a good reason anyone and everyone can start their own blog. Not just because it’s easy, but because it allows people to write about whatever they want, whenever they want. This is why starting a blog is an excellent starting point for writers interested in making headway in a specific field. If you can practice writing more often by writing about things you really like writing about, you’ll find yourself writing more, at pretty decent quality, without feeling completely drained afterward. When you write about what you know, which you can easily balance with learning more about what you don’t know so well in order to be able to write about that, too, it feels a lot less like work. Your “I’m writing this because I have to” attitude gets to go take a much-needed nap for a few hours. Publishing often on your blog is an effective strategy; consistency is one of many keys to writing success. But sometimes even that can start to feel a bit tedious after awhile, even if you genuinely enjoy doing it. It’s important to expand your horizons if you want to show you can write a lot and still write well. Keep publishing on your blog, but also be on the lookout for other writing opportunities, even small ones. If you have some professional advice, LinkedIn is a nice way to self-publish. Is there a magazine looking for how-to articles on subjects you like? Are there blogs in your niche you can apply to guest post on? Sometimes, the more work you give yourself, the more productive, and prolific, you’ll be. Just start small, and don’t commit to more than you can handle. Start off with your own blog and maybe another outlet, and grow your audiences there, then see where you can go from there, and if you have room in your schedule to fit it in. The key to writing a lot, generally, is to make it a priority. But always remember that taking time to rest is still important. As you get more and more used to writing in large quantities (while still paying attention to quality, of course), you might have to schedule time to not write, instead of the other way around. This is a good thing. If you take some time to practice how to best make it work for your life and schedule. I like your post, I have the same opinion,having trouble with your dissertation or essay?check this out you will not regret.